Unmasked: The wonderful Calgary artist Lisa Brawn carves and paints reclaimed wood: lots of owls and ravens and ruby-throated hummingbirds, but also zombies, Beatles, prime ministers, and the occasional hockey player. 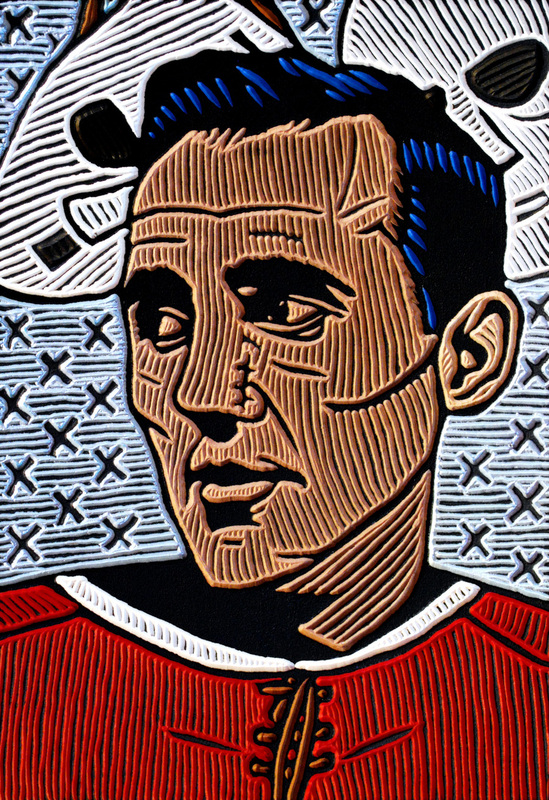 Jacques Plante, for instance, on a block of cherry-wood. To browse and maybe to buy — or just to marvel at her colours and craftsmanship — visit http://www.lisabrawn.com. Gary Bettman put a number, this week, on how many times players hit one another across the league over the course of a season: “55,000, give or take.” I don’t think that includes punches to the head, just bodychecks. His point was that, once in a while, there’s a bad one in there, and when there is, the NHL deals out a suspension. Bettman was in Columbus, where he also talked about Philadelphia’s brawl with Washington wherein one goalie, the Flyers’ Ray Emery, skated down the ice to attack another, Braden Holtby of the Capitals, who didn’t want to fight. “Protect yourself,” Emery said, later, is what he told Holtby as he swung at him. Earlier in the week, Brian Burke published a defence of fighting in USA Today. Some people just don’t get it, he said. The players are all volunteers, and if they want to punch one another, in the head, or anywhere else, who are people who write about the game, never having played it professionally, to dare to tell them not to? Ken Dryden was in print this week, too, in The Globe and Mail, answering Bobby Orr who, in his new book, makes his own argument in favour of fighting. The model for an NHL without fighting is right there in front of us. It’s not the Olympics, though opponents of fighting often say it is. The Olympics are too unique an experience. The ice surface is bigger. Players put on their nation’s jerseys and, in front of countrymen who know their game and those who don’t, avoid doing things that might be misunderstood. The real model is the playoffs. It’s the time of year that fans love best; when the best hockey is played. “This makes hockey look bush,” said Neil Smith on Sportsnet’s Hockey Central, regarding Emery chasing down Holtby to punch his head. Paul Holmgren, they were talking about, the general manager. “We just folded up like a cheap suit,” he said after the game. When Semyon Varlamov was arrested this week by Denver police, charged with kidnapping and assaulting his girlfriend, his father said that no crime had been committed, whatsoever. Varlamov went to court on Thursday and was released on a bond of US$5,000. The Denver Post struggled to put it all in perspective. The Avalanche are off to a torrid 10-1 start and have become the talk of hockey under first-year coach Patrick Roy. Duchene doesn’t think this will derail the Avalanche. Varlamov played on Friday night in Dallas and won. Coach Roy said afterwards that the team wanted to show it’s a family. A reporter asked: Does this show that Varlamov can handle adversity? Jacques Plante was allergic, meanwhile, to Toronto. That wasn’t this week — that’s an old story, resurrected on the occasion of Friday’s anniversary of the night in 1959 that Plante first put on a mask in the Montreal goal. Maybe you remember? In New York that night, Andy Bathgate’s backhand from 15 feet caught Plante on the left side of his nose. That’s how The Jacques Plante Story (1972) tells it, the book the goalie wrote with Andy O’Brien. Bathgate “blasted” it — unless, as Raymond Plante’s Jacques Plante: Behind The Mask (1996) says, he “slammed” it. When Todd Denault talked to Bathgate for Jacques Plante: The Man Who Changed The Face of Hockey (2009), he said it was a wrist shot, not too hard, though decidedly vengeful. Plante had cut him previously in the game, and he was determined to get him back. Either way, Plante was knocked out. When he revived, Maurice Richard and Dickie Moore helped Canadiens’ trainer Hector Dubois to get him to the dressing room. Dr. Kuzuo Yanagisawa sewed him up: seven stitches. The Rangers had two emergency goalies on call, one of whom, Archie Knox, worked as an usher at Madison Square Garden. O’Brien says Plante’s gums were bleeding when he told coach Toe Blake he wouldn’t be going back in without his mask. “All right, Jacques, you can wear it this time if you want,” Blake said (Raymond Plante) or “Why don’t you wear your mask for the rest of the game?” (Denault) or “Wear your mask if you like, Jacques” (O’Brien). The organ played “For He’s A Jolly Good Fellow” when Plante returned to the ice. “Pettymys!” lamented a Helsinki newspaper this week, which is Finnish for “Disappointing!” It wasn’t just that a stick to the mouth had cost Teemu Selanne, 43, four or five teeth and 40 stitches; he’ll be out for at least two weeks, which means he’ll miss Anaheim’s only visit to Madison Square Garden this season, which Selanne has said will be his last. He was asthmatic, and he found it hard to breathe Toronto’s air. “He was a special player; those guys don’t come along too often,” Scotty Bowman told Tony Gallagher from The Province. “I’m sure it’ll be a lot of fun,” said Matt Moulson, after the trade that sent him from the New York Islanders to the league’s worst teams, Buffalo, in exchange for Thomas Vanek. A big Finnish team, Jokerit, announced they’d be leaving that country’s Elite league to play in the Russian KHL and while some people are objecting, Jokerit’s general manager isn’t one of them. Hockey, said Jari Kurri, is globalizing. In The Journal of Sports Economics, Jiří Lahvička published his findings regarding “The Impact of Playoffs on Seasonal Uncertainty in the Czech Ice Hockey Extraliga.” The nub of it? Using a Monte Carlo simulation, he demonstrated that although the additional playoff stage heavily favors higher-seeded teams and consists of many games, it lowers the average probability of the strongest team becoming a champion from 48 to 39%, and thus increases seasonal uncertainty.